« Would You Like Some Jewelry? Enter this Giveaway! This Post is Brought to You by the Letter B.
Hi Everyone!! I hope you all had a fantastic Thanksgiving and were able to spend the time with the people you love. And for those of you not in the US… I hope you had a nice Thursday 🙂 Today I wanted to talk about three different topics and all of them begin with the letter B so I decided to combine them into one post. Boots – I bought some boots online yesterday (more proof that I LOVE shoes). These were some boots that I’ve wanted for a long time to replace an old pair that are literally falling apart on me. But I wanted a good pair, and that means saving up some money. Unless you shop after Thanksgiving. I got the pair below in black. Normally they are $90 and I got them for only $24. Um.. Yes!! Black Friday – I went Black Friday shopping today. It was only my third time going but this was my best ever. My first year I just went with family. I didn’t buy anything, just wanted to experience it. Last year I went and just bought myself presents because I was shopping with all the people I needed to buy for. This year, I still bought myself a couple items but for the most part got almost all of my Christmas shopping done!! And I saved SO much money I was shocked. I got two different sweaters for my brother. Both sweaters were normally $50 each and I only had to spend $20 each. And that was just a small portion of what I got. I hope my family and friends are cool with receiving clothes because that’s the majority of what I bought; someone’s got to dress these people. 🙂 I wish we had one more Black Friday event so that I could finish the shopping I need and save even more money. 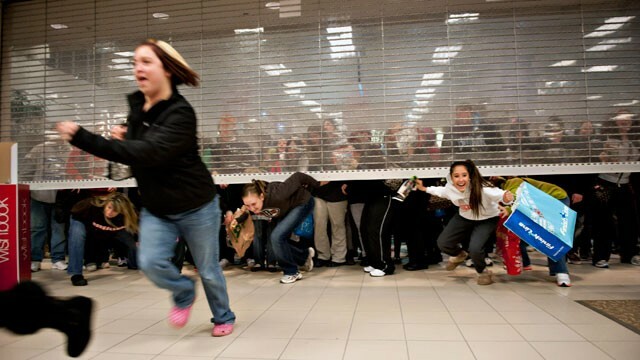 Black Friday is a fantastic event in my opinion. Ok, mine was much less crazy than this… Kind of boring actually. Normally I would see something like that say, “yeah right” and go on about my day. But they are not lying. The first time I used it, I washed my face and put this on before my makeup. I hadn’t even put on a drop of makeup and my skin looked better than I have ever seen it look. After my makeup, I almost didn’t recognize myself (in a good way)! My skin had a glow that I always wish I could get and it gave me so much added confidence and self-esteem that I would have paid more than the $6-8 I paid (I don’t actually remember how much it cost). This will definitely be an item forever in my daily routine! This little tube is full of magic!! What about you? Did you Black Friday shop or are you a believer in the BB creme magic? PS: I made a pie yesterday and will be blogging about it later, complete with pictures! !